If ten years ago you told me that one of the best video game adaptations of a TV show or Movie would be a RPG version of the long-running satirical cartoon South Park that featured turn based combat, I may have been skeptical. 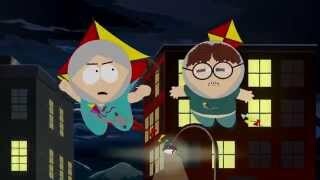 However 2014’s South Park: The Stick of Truth proved to be just that, a surprisingly successful blend of the famous cartoon’s intentionally janky animation style and over the top humor with light role-playing elements and turn based combat mechanics. Riding the success of this surprising project, South Park: The Fractured but Whole follows very much in the same footsteps, tweaking the combat and switching from a fantasy theme to a super-hero one, but otherwise following the same template that proved successful a few years ago. 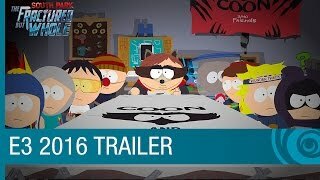 While The Stick of Truth took a stab at lampooning fantasy tropes with a premise of the kids of South Park role-playing inside a fantasy universe of their own creation, the sequel takes aim at the Super Hero industry, with the kids trying to build up their own superhero franchise complete with movies and Netflix series, in the hopes they can one day sell it and make a lot of money. The game’s subtitle, The Fractured but Whole, partially refers to the fact that the franchise has become divided due to disagreements about which heroes get their own movies and TV shows. 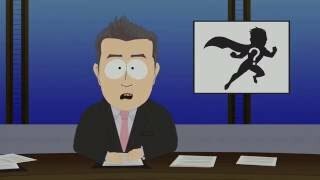 Though I expected this superhero spoof to make up the main thrust of the sequel’s fun-making, it ends up being more of a backdrop for a variety of hot-button issues the game fearlessly mocks in typical South Park fashion, such as the ridiculously confusing nature of modern gender identity politics, and the ongoing friction between African Americans and Police in the USA. Even though the game rarely takes a meaningful stance on these issues, the way it deals with them is silly and hilarious in the ways that made South Park such a phenomenon to begin with. Another recent political event is handled a bit more subtlety but is equally effective. Ultimately, the humor and writing are what make The Fractured but Whole worth playing. The significant novelty value that came with exploring a visually accurate representation of South Park that existed in The Stick of Truth is unsurprisingly reduced in the sequel, and the gameplay mechanics are fine but thoroughly unremarkable. The biggest change on the gameplay front is the combat system, which now takes place on a grid and allows the characters to be moved around. Fractured does away with action points, instead allowing each character to move a certain distance and perform one action, be it an attack, healing ability or limited use item. There is a pretty good variation of characters and abilities that you will have access to, and this helps to keep at least major combat encounters feeling reasonably fresh for the game’s 15-20 hour duration. Due to events in the story, you will need to learn to fight with a variety of teammates, and the game will frequently remind you that these ‘combat’ encounters are generally just a bunch of kids playing make-believe, such as everyone having to stop fighting and move to the side of the road when a car goes by, or one of the kids deciding that something wasn’t fair and they should get an extra turn. What impressed me the most about the combat is the variety of enemies you fight, and the unique attacks they will employ, with some genuinely creative and surprising encounters that change up the rules and force you to rethink your strategy on the fly. This variety and rule-bending is important, because the combat isn’t particularly challenging or deep, and ability progression is somewhat lacking. Though you gain access to a lot of different abilities as you play through the game, you can only ever have three normal abilities and one super ability equipped at any given time. You do gain access to some farting abilities that can let you skip an enemy turn or pause time for some free damage, but that is it. For a game that has no problem playing with the rules of combat, this seems excessively limiting as I eventually found a few abilities that seemed quite effective and saw no point in experimenting with the others that became available. The lengthy animations that play for super abilities are amusing initially, but become tiresome after the first few times. By the mid-point, the random mobs you fight in the open world felt purely like a chore. Overall the combat feels like a step sideways compared to The Stick of Truth rather than a direct improvement. Outside of combat, most of the gameplay involves exploration and easy puzzle solving by means of The New Kid’s incredible flatulent prowess. The environments are littered with special objects that you can interact with by entering ‘inspection’ mode and using a fart-based ability in combination with another character to gain access to a new area or otherwise inaccessible item. These puzzles aren’t particularly difficult, nor do they contribute much humor beyond the initial crass but amusing reveal of each fart-based ability, such as using powerful farts in combination with Kite-man to reach high-up places using the art of Fartkour. These abilities involve nothing more than quick-time events on the part of the player, which are generally overused throughout the game. The lack of satisfaction that comes from these puzzles brings up the question of what purpose the pho-RPG, open world design has to begin with. All of the game’s best moments are present in the more story heavy sections, with exploration and side quests feeling bland and uninspired aside from the occasional Easter Egg or amusing bit of incidental dialog. Generally speaking, the more free form, exploration-heavy sections lack the humor and personality that are necessary to distract from the simplistic gameplay. Even though you level up in Fractured, the metric that will determine if you are powerful enough to take on a mission is your Might level, something influenced by artifacts you equip. This means that any clothing you find is cosmetic, making these artifacts the most valuable thing you can find. Most of the loot you come across will be crafting items, as crafting has been added as another mechanic. Though the system is easy to understand, it mostly serves to make the exploration and looting less satisfying as instead of finding armor and weapons like in The Stick of Truth, you mostly pick up random stuff that will later be used to craft consumable items for combat, cosmetic items or artifacts. While most of the exploration and puzzle solving is optional, there are times when you will need to increase your character’s Might in order to take on the next story mission, but fortunately the requirements are pretty reasonable so you won’t have to spend too much time grinding for experience. Even though none of the exploration, puzzle and crafting mechanics actively annoyed me, they really don’t add much to the experience at all. One of the most remarkable things about The Stick of Truth is how it looked and sounded exactly like the show. Nothing has really changed about the presentation in the sequel, which given the circumstances isn’t a problem. The game visuals are once again almost indistinguishable from the show, and the audio is on the same level, though I felt the music was overall less memorable this time around. The game performs well enough apart from a few odd pauses in combat, and I did get stuck on an infinite loading screen at one point. South Park: The Fractured but Whole is a sequel that largely plays it safe, tweaking some gameplay aspects but making very few changes to the overarching design. The result is an experience that lacks the novelty value of its predecessor, with significant stretches of rather bland gameplay between the much more successful scripted and story-heavy sections where the funniest moments and best combat encounters await. This typical South Park humor and the more inventive fights make this sequel worth playing for fans of the series, just don’t expect to be blown away. The Fractured once again emulates the look and sound of the show perfectly, though I felt the original score was more forgettable here. The grid-based combat succeeds when the rules are shaken up with unique encounters, to make up for the unremarkable progression. Puzzle solving, crafting and exploration are bland and add little to the experience. There are some pacing issues for the game’s 15-20 hour duration, but the story-heavy sections are consistently entertaining thanks to classic South Park humor. The game generally runs fine apart from some strange pauses during combat and a rare issue with infinite loading. Though mechanically The Fractured but Whole can feel rather flat, it remains a genuine South Park production with all of the humor, farting and ridiculousness you would expect, and that should be enough to satisfy fans - even if it doesn't wow them.